Now that we’ve made it to Autumn, we can finally start looking forward to cooler weather and warm, fuzzy sweaters and stuff, right? Lately, the weather is having an identity crisis, and every time the forecast shows 80 degree temperatures I have a Michael Scott moment. To make sure you’re prepared for whatever may come, here are some tips on how to tough out a hypothetical week of wild Chapel Hill weather. Forecasters call for partly cloudy skies and a 30 percent change of afternoon thunderstorms, with temperatures near 74. Translation: temperatures will hover around 50 until 11 a.m. and then suddenly spike to 80 for the rest of the day; cloudless skies will linger until around 3 p.m., when severe storms roll in and the cats and dogs will begin to fall from the sky. To prepare, make sure you leave your room wearing your tank top (or t-shirt) and shorts underneath your warmest sweats. Don’t forget to put on your rain boots and grab your umbrella if you won’t be back until later in the day. Basically, you’ll want to look like a five-year-old dressed you. Looks like the rain that came in on Monday isn’t going away soon, and hey! Would you look at that? Alert Carolina says we’re under a tornado watch. The forecast also says temperatures will stick around in the mid to lower 80s for most of the day, meaning it’s going to feel like you’re stepping into bathwater once you leave your room. Because of the monsoon, you’re probably better off wearing your swimsuit to class. Or just don’t go to class at all. The forecast may show an afternoon high of 80 degrees, but the morning low is at…40??? What?! This is the moment when you’ll have to make a crucial decision: do you wear your shorts and t-shirt for when it warms up, or do you throw on that new sweater, scarf and boots to handle the chill? Remember to take into account that your classroom’s air conditioning is still blasting at full force. The choice is yours. Alright, finally a nice, cool 73 degrees. Actual partly cloudy skies. You might venture to get a warm, caffeinated beverage. It’s finally beginning to feel like Fall. It’s probably safe to head out in your oversized sweater or hoodie. Hahaha, just kidding! The forecast calls for temperatures near 90 and abundant sunshine. Bring a towel to wipe away the sweat from walking to class. And you might want to take an umbrella, because the sudden heat probably means it’s going to storm pretty bad in the afternoon. So you want to go to the football game. That’s great, but the forecasters are calling for more 90 degree weather and cloudless skies. Make sure you wear something cool because you are going to be cooked like a turkey in the Tar Pit. 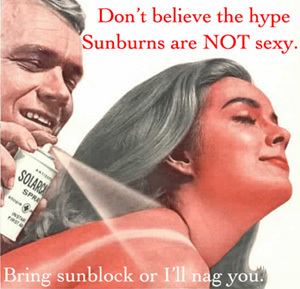 And lather on that sunscreen. The forecast shows highs in the upper 60s with mostly cloudy skies. It’s a bit chilly, and you want to go outside, but you’re stuck in your room suffering from the sudden cold you caught from all the crazy weather. It’s probably best you just sit inside, do some work and take some medicine. And find some soup. It’s technically Fall, so it’s soup weather, right?